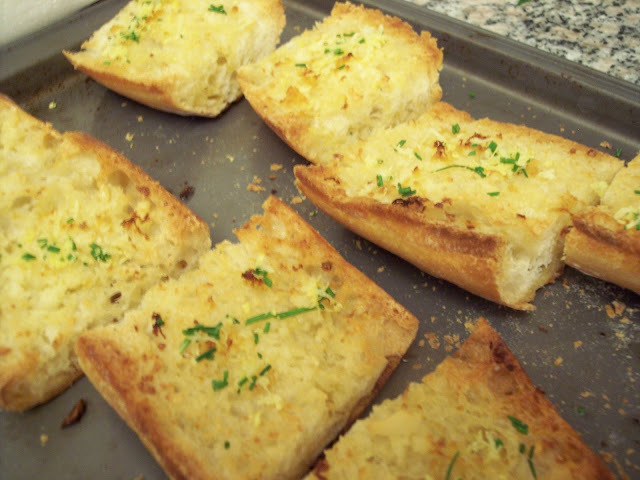 This is the quick, but delicious, garlic bread that I made to go with the "Sopranos"- themed Italian dinner that CH and I created. And although I don't like to follow a particular recipe for this kind of stuff, I got some inspiration from Heidi Swanson (my new veg crush!) from 101 Cookbooks. The ingredients involved some Earth Balance vegan butter, a few cloves of minced garlic, some chives (which are currently growing in my Chia-Herb pot), and a bit of lemon zest. It was mmm-mmm good!